I’ve long been a fan of Vita Liberata’s Capture the Light skin perfector; it adds a tint, a touch of glow and somehow seems to blur imperfections, leaving your legs looking as though they are clad in some sort of invisible miracle tights. Capture the Light has been relaunched as Body Blur Instant HD Skin Finish, and it’s every bit as brilliant as the original incarnation. Easy to apply (it’s easiest with a mitt, so that you don’t get it all over your hands), this air-brush-effect body cream gives your skin an instant lift and sunkissed glow. 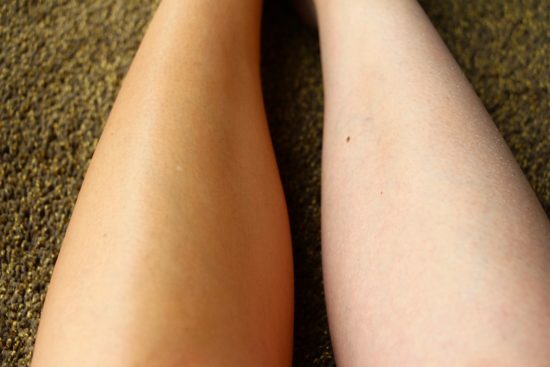 No self-tanner required – no potential for streaky disasters, no hanging about in your knickers with your arms in the air waiting for your tan to dry. It’s body makeup, basically, but with an extra bit of pizazz. That’s a good point, actually; transfer is minimal, with regards to the colour. I mean I wouldn’t want to roll about on my brand new Egyptian Cotton (1000TC, Kelly Hoppen at QVC, amazing) bedsheets, but guess what? I just accidentally did. I completely forgot that I was wearing the Body Blur. I can tell you that there was no colour transfer from just lying there and wriggling about and stretching to get the TV remote, but when I knelt up to rearrange the duvet and scraped my shin across the bed there was a bit of a mark. In real life, as in, out and about, I think you’d really have to go some to get it on your clothes – street dancing in a thunderstorm, etc – but I’d avoid bright white outfits if you’re the cautious type. 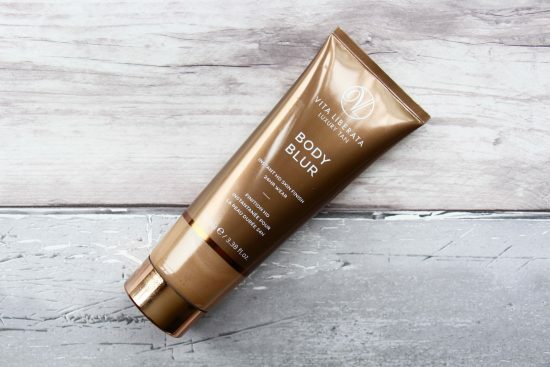 Overall, bravo – Vita Liberata’s Body Blur is like air-brushing in a tube. It does for the legs, I think, what La Roche-Posay’s excellent Effaclar BB Blur does for the face. Of course it’s meant for the entire body, but it’s always the shins that seem to look crappy isn’t it? Veiny and pallid and dry. Body Blur is £29.95 at LookFantastic here.